Shaped like the Menorah on the symbol of the State of Israel, this Hanukkia connects past emergence from oppression with the return of the Jewish people to their homeland. Made of sterling silver by Hadad Bros. of Israel, it weighs 430 grams. If you wish to emphasize your connection to the state of Israel during the holiday of Chanukah, this is the Menorah for you. Hanukkah is a Jewish Holiday which symbolizes the freeing of the Jewish people from the oppression of the Greek empire. After wresting their land and Temple back from the Greeks, the Jewish people restarted the ritual of lighting the Menorah in the Temple. Several centuries later, when the Romans destroyed the temple, they took the Holy instruments of worship with them, and immortalized their victory over the Jews by depicting the Temple Menorah on the Titus gate in Rome. After close to two millennia, when Jewish sovereignty was restored in the Land of Israel, the State of Israel chose the Menorah picture from the Titus gate to be the symbol of the renewal. This Hanukkia is made to look like the one in the State of Israel's symbol – hence the name "Menorat Ha'Atzmaut" – Independence Menorah. The base of the Hanukkia sits on top of four smooth silver balls for legs. The sides of base itself, just like the base in the Israeli symbol, are etched to look like stones on a wall. Two layers of the stones narrow the base as it reaches upwards, and the top of each layer is of smooth shiny sterling silver. The second layer is topped by a rounded smaller base for the column of the Hanukkia, gently etched with upward lines topped by horizontal lines. A shiny smooth silver half dome holds the rest of the central column. 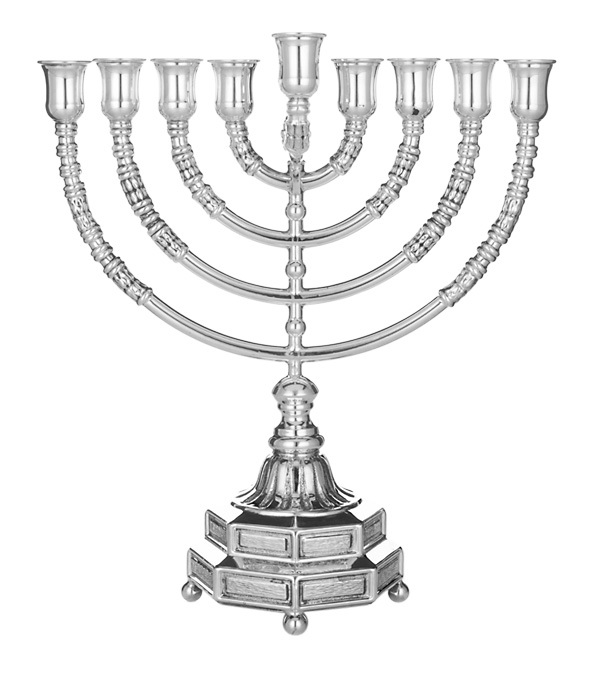 The central column itself is of smooth silver which seamlessly connects to the eight branches of the Menorah. A ball like smooth silver shape separates each level of branches. The branches start out smoothly, and then halfway to the top they are decorated with the same style of horizontal and vertical etchings, in a combination which makes them look like jewelry. All the decorations end at the same height and on the same line, and are topped by smooth silver cups suitable for lighting either oil candles or wax candles. The ninth cup is set away and above from the line with all other eight candles, serving as the "Shamash" – literally "servant" in Hebrew, or "caretaker". This Hanukkia by Hadad Bros. of Israel can make a meaningful present, and will be a significant addition to your Judaica collection. It weighs 430 gram.